Evans' strikingly large watercolours, (typically they measure over one metre in height or breadth), span two decades from the late 1960s to the late 1980s, evoking a vision that is still surprisingly potent today. David Evans' death in a road accident in 1988, at the age of 59, bought to an abrupt end the career of one of the most distinguished watercolourists of his generation. 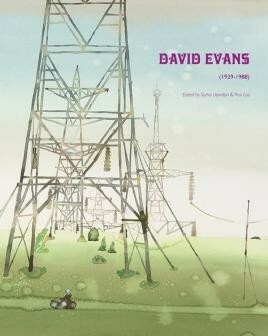 The recent discovery of pictures remaining in his studio, nearly thirty years after the memorial tribute staged by the Redfern Gallery in 1988, provides the opportunity for a new generation to discover his work, though the publication of this first ever book on David Evans and the accom- panying touring exhibition. Evans' strikingly large watercolours, (typically they measure over one metre in height or breadth), span two decades from the late 1960s to the late 1980s, evoking a vision that is still surprisingly potent today. They have all the period charm of the glam-rock era they so powerfully evoke but at the same time they are highly charged with the political energy of the pe- riod and mirror Thatcher's Britain, with its Industrial unrest, its towns and country undergoing transformation, the Faulklands war and threat of the Evil Empire, the building of nuclear power stations and the dawn of awareness about Climate Change as a political issue. Evans was an ardent campaigner and environmentalist. The landscapes, (a homage to his native Suffolk) are peppered with industrial plants, landfill, scrap heaps, and encroaching roads and army maneuvers. Urban subjects, similar in some ways to the compo- sitions of Lowry, show factory plants, spectators' sports, cafeterias, the interiors of museums, city centers and beach scenes.